What Dental Services are Available through my Family Dentist? Dentistry is filled with a large range of specialties. Dentistry includes a broad spectrum of complex issues and procedures with dentists who have specialized and focused on specific areas. Your primary dentist is most likely what is known as a General or Family Dentist. • Educate the patient on dental health through discussion, and demonstrating brushing and flossing techniques. • Prevent future problems through hygiene and maintenance. This includes your dental cleaning, fluoride treatments as needed, and sealants as needed. 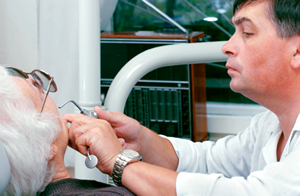 • Detect issues that need restoration through examination and dental x-rays. • Make the restorations needed or provide referrals for how to have the restoration completed. The best way your family dentist can perform these tasks is through establishing a continual working relationship with your mouth by scheduling appointments at least twice a year. Can Family Dentists do Root Canals? The best answer for this question is yes/no. An important aspect to any dentist is continuing their education with regular classes, lectures, and experience. Family Dentists are educated is a large range of dental issues, but their fields of study can vary. Some dentists may continue their education on endodontics, ie. root canals, where another dentist may have focused on gum disease. Some may focus on pediatric dentistry where another may focus on dental implants. The range is wide, and the services that one family dentist can provide will differ from what another family dentist can provide. When choosing a dentist, it is always best to ask what their field of study has been and what services they prefer to send referrals to specialists. Please contact us today if you have any questions about our dental services.